Pomander candles are old-fashioned fragrant balls of citrus and cloves that fill the room with the scent of Christmas. The embedded candles enhance your room with a festive holiday atmosphere via flickering light. To make these candles, you need to use tealights, which are half-dollar size candles about 1 inch thick. Make sure that your tealights come in small metal cups (most do). Slice a thin piece of skin from the stem end of the orange to create a stable base. On the opposite end, use a sharp paring knife to cut out a hole that’s just large enough to fit the tealight into. The tealight should fit down in the orange with the top of the tealight even with the skin of the orange. Do not insert the tealight yet. Insert cloves into the fruit in any pattern, even covering the whole fruit if you like. 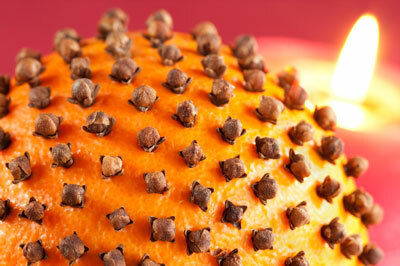 If the cloves are not going in easily, poke holes with a toothpick first and then insert the cloves. Place one pomander on a small plate, or a bunch of them on a tray. Insert the tealights, light, and enjoy. You can use any citrus fruit. Try small grapefruits, lemons and limes, or an assortment of citrus. Kumquats, while a bit more difficult to work with because of their tiny size, make adorable little pomanders. These would not be hollowed and filled with candles, but just left as is and used for their spicy scent. Pile the kumquat pomanders in a small bowl and place them in the living room or bathroom or tie a thin ribbon around them and hang them on your tree.